The Carlsbro PN1002's sampled voices feature 138 different instruments. 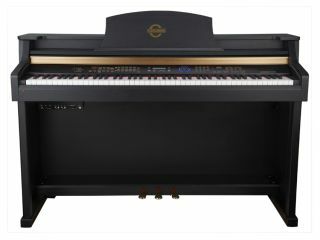 NAMM 2012 PRESS RELEASE: Launched at Music China last year, the PN1001 P240RW and PN1002 P240PE feature rosewood and hand polished ebony lacquer finishes, respectively. Both elegant finishes are complemented by a stylish sliding key cover mechanism. Their ultra realistic feel and touch, contemporary styling, advanced technology and functionality come at a highly competitive price. The pianos are designed for all levels of players, from absolute beginners to professional musicians, whether in the home, in music schools, theatres, houses of worship or other performance spaces. Eighty-eight full size hammer-action weighted keys, with adjustable touch response, accurately recreate the feel of an acoustic grand piano. 64 note polyphony, high quality stereo sampled voices featuring 138 different acoustic and electronic instruments, various modes and effects - including dual and split voice, reverb and chorus - 100 auto accompaniment styles and 50 accompaniment songs, metronome, and integrated 3-track / 4 song recorder / sequencer, combine to make these pianos a powerful performance and practice instrument. The user friendly control interface and backlight LCD display enable quick and easy access to and control of all the onboard features and functions. The integrated powered stereo speaker system ensures exhilarating, highly realistic sound reproduction. Additionally, extensive analogue and digital INs / OUTs facilitate connection to PA systems or dedicated keyboard amplifiers such as the Carlsbro Colt, and to recording systems and DAWs; as well as enabling playback of other instruments and sound sources via the internal speaker system. Also included is a USB 2.0 audio and MIDI interface for use with computer based music systems. Commenting on the introduction of the new Carlsbro digital pianos, International Sales Director Andrew Bishop stated: "These are exceptional quality, value for money instruments that are going to have very wide appeal across the MI market. A whole new range of portable keyboards is set to follow the introduction of these pianos, marking our entry into musical instruments. This is a product area where Carlsbro's renowned brand quality, reliability and exceptional value will offer international distributors and their MI retailers new opportunities." Information taken from official press release, for more visit Carlsbro.